In all seriousness though, I am really excited to share this vegan product with you, and the next time you get the protein question, you might feel inclined to gently shove a plate of these under the asker's nose. 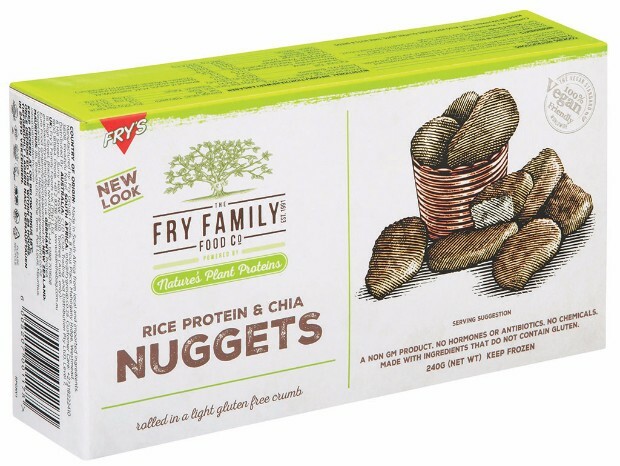 Fry's, established in 1991, is a company that produces a wide range of veggie food products - from veggie sausages to burgers, pies & pastries to these awesome kid-friendly nuggets. The nuggets are made using rice protein, chia seeds, soy protein and a host of delicious seasoning such as rosemary, sage, marjoram, turmeric, ginger and black pepper. These are all encased in a golden, gluten-free coating consisting of rice flour, gram flour, maize starch, paprika, salt and pepper. One of the stand-out things to mention is that all the ingredients are non GM, free from hormones, antibiotics & chemicals, and high in fibre, protein & omega 3's - proving that fast, convenience foods do not have to be riddled with unhealthy ingredients. This product seriously exceeded my expectations in terms of taste and texture. I must admit that I was a little sceptical when I saw that they are also gluten-free. It's terrible of me, I know, but whenever I think of gluten-free versions of normally gluten-containing foods, I immediately imagine them to be dry, grainy and unappealing. These were far from that! I enjoyed every single bite and couldn't believe that it was all vegan. I served mine with a sweet potato, broccoli and spinach salad (click here for the recipe) and it made a filling, satisfying dinner. They took only 15 minutes in the oven (at gas mark 4) and they turned out lovely and crispy on the outside, and succulent on the inside. The nuggets are well seasoned, which is one of the most important things I look out for in food. Note: Thanks to the Vegan lifestyle Association for the opportunity to carry out this review. It has not been paid for and the products were sent free of charge. This is my genuine and unbiased review of the product. Great review Tomi thanks, I tried them the other week too and loved them. Really crispy like you say. Healthy fast food - it's gotta be good eh! Your salad sounds amazing with them too.